Some pastors are making a bold claim: Jesus wasn't poor; he was rich. (CNN) -- Each Christmas, Christians tell stories about the poor baby Jesus born in a lowly manger because there was no room in the inn. But the Rev. C. Thomas Anderson, senior pastor of the Living Word Bible Church in Mesa, Arizona, preaches a version of the Christmas story that says baby Jesus wasn't so poor after all. Anderson says Jesus couldn't have been poor because he received lucrative gifts -- gold, frankincense and myrrh -- at birth. Jesus had to be wealthy because the Roman soldiers who crucified him gambled for his expensive undergarments. 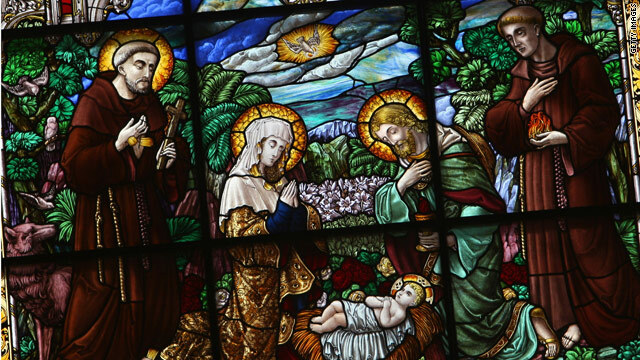 Even Jesus' parents, Mary and Joseph, lived and traveled in style, he says. "Mary and Joseph took a Cadillac to get to Bethlehem because the finest transportation of their day was a donkey," says Anderson. "Poor people ate their donkey. Only the wealthy used it as transportation." Many Christians see Jesus as the poor, itinerant preacher who had "no place to lay his head." But as Christians gather around the globe this year to celebrate the birth of Jesus, another group of Christians are insisting that Jesus' beginnings weren't so humble. They say that Jesus was never poor -- and neither should his followers be. Their claim is embedded in the doctrine known as the prosperity gospel, which holds that God rewards the faithful with financial prosperity and spiritual gifts. The prosperity gospel has attracted plenty of critics. But popular televangelists such as the late Oral Roberts, Kenneth Hagin and, today, Creflo Dollar have built megachurches and a global audience by equating piety with prosperity. The prosperity gospel, however, clashes with the traditional depictions of Jesus as poor. That's because the traditional image of Jesus as destitute is wrong, says the Rev. Tom Brown, senior pastor of the Word of Life Church in El Paso, Texas. "I believe he was the richest man on the face of the earth because he had God as his source." The proof, he says, is scattered throughout the New Testament. One example: The 12th chapter of the Gospel of John says that Jesus had a treasurer, or a "keeper of the money bag." "The last time I checked, poor people don't have treasurers to take care their money," says Brown, author of "Devil, Demons and Spiritual Warfare." A debate over the economic status of Jesus may seem nonsensical to some. Does it really matter whether Jesus was rich or poor? It matters to people like Luke Timothy Johnson, a prominent New Testament scholar and author. He says that a rich Jesus is a distortion of history and a threat to one of Christianity's core teachings: God's identification with the poor. "If Jesus reveals God, there is something powerful about God appearing and working among the poor," says Johnson, a New Testament professor at Emory University's Candler School of Theology in Atlanta, Georgia. "Jesus' lifestyle is not of one in a gated community or a corporate office," says Johnson, a former Benedictine monk. "You don't have to go through a security gate to get to Jesus. People touch him. He reached out and touched children. His accessibility is one of the most powerful messages of Christianity. In Jesus, God is with us, and the majority of us are poor." Some prosperity preachers extract a different message from the same biblical texts. Brown, the El Paso minister, says he doesn't say that Jesus was rich because he wants to give people an excuse to live self-indulgent lives. He wants people to understand that Jesus used his material and spiritual riches to help people -- and so should they. Brown says Jesus' own words prove that he wasn't poor. "I believe he was the richest man on the face of the earth because he had God as his source," Brown says. Jesus' wealth is evident even in the Gospel accounts of his execution, some pastors say. The New Testament reports that Roman soldiers gambled for Jesus' clothing while he hung on the cross. They wouldn't gamble for Jesus' clothing unless it was expensive, Anderson says. "I don't know anybody -- even Pamela Anderson -- that would have people gambling for his underwear," Anderson says. "That was some fine stuff he wore." Anderson says Jesus never would have had disciples or a large following if he was poor. He would not have been able to command their respect. "The poor will follow the rich, the rich will follow the rich, but the rich will never follow the poor," Anderson says. Twisting scripture for personal gain? Johnson, the Emory University New Testament professor, calls Anderson's argument "completely illogical." The only way you can make Jesus into a rich man is by advocating torturous interpretations and by being wholly naive historically. "So Martin Luther King must have been a millionaire," he says. "Crowds followed Siddhartha Buddha and he was poor. And mobs followed Mahatma Gandhi, and Gandhi wore a diaper, for God's sake." The argument that Jesus was wealthy because the soldiers gambled for his clothes at his crucifixion doesn't makes historical sense, either, says Johnson, author of "Among the Gentiles: Greco-Roman Religion and Christianity." "Crucifixion was the sort of execution carried out for slaves and for rebels," Johnson says. "It wasn't an execution for wealthy people." A Baylor University religion professor who specializes in the study of the poor in the Greco-Roman world also says there is "no way" that Jesus could be considered wealthy. Bruce W. Longenecker says life in Jesus' world was brutal. About 90 percent of people lived in poverty. A famine or a bad crop could ruin a family. There was no middle class. "In the ancient world, you were relatively poor or filthy rich, there's very little in-between," says Longenecker, author of "Engaging Economics: New Testament Scenarios and Early Christian Reception." The New Testament is full of parables where Jesus actually condemns the rich and praises the poor, Longenecker says. In the sixth chapter of the Gospel of Luke, Jesus actually curses the rich, he says. "The only way you can make Jesus into a rich man is by advocating torturous interpretations and by being wholly naive historically," Longenecker says. Anderson, the Arizona pastor, doesn't buy that argument. He says the church has actually been damaged by teaching that Jesus was poor. God wants his followers to be rich, not for selfish gain, but to help others in need and spread the gospel. When he first preached that Jesus wasn't poor to his church, Anderson says he "ruffled some feathers." Now, he says, his church has 9,000 members and a global ministry. "That's so pathetic, to say that Jesus was struggling alone in the dust and dirt," Anderson says. "That just makes no sense whatsoever. He was constantly in a state of wealth." Can Joel Osteen help you pay your bills?